Our second weekend of our new League Cup sampling and analysis process has been a success. Last weekend we analyzed 22 Cups to create an accurate picture of the metagame at the time; this weekend our sample size climbed to 27 Cups. In this article I'll discuss the top decks of the weekend, some "big movers," and some statistically-supported predictions for next weekend. Gardevoir-GX retains its top spot from the previous weekend, falling only slightly from about 20% of the meta to about 18%. More surprising is the sudden rise of VikaBulu. The deck shot from 7th place (7.61% of the meta) to 2nd (12.14) in just a week, and barely any top cuts in our sample fail to feature at least one Bulu player. Some big names playing the deck into Top 8 or higher include Zak Krekeler, Jac Carter, Tristan Macek, and of course John Roberts II, who is known as perhaps the biggest fan and best player of the deck (he has topped multiple Cups with it and both of his Top 32s at 2016-17 major events were with it; he has also developed an Expanded version with Virizion-EX and Scoop Up Cyclone). Later in this article I'll look at four VikaBulu lists and discuss what works about them and how they are adapted to local or expected metagames. Also unchanging from the previous weekend is Golisopod-GX/Garbodor in third place. 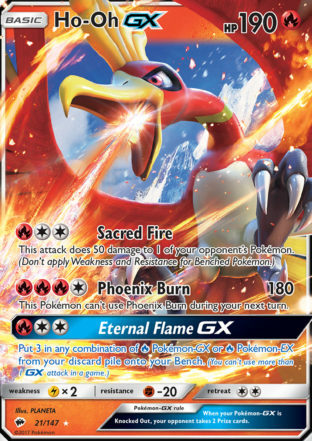 Rounding out the top five we have the two big fire decks, Volcanion and Ho-Oh-GX/Salazzle-GX. Both are on the rise from the last weekend: Volcanion up two spots and Ho-Oh up five. The SixPrizes squad has been working on the Ho-Oh/Salazzle deck and Xander Pero took home a 1st place with it while the entire Schemanske family made Top 8 with it at another Cup. Some big droppers this week: Metagross-GX from 2nd to 7th, and Alolan Ninetales-GX from T-4th to 8th. 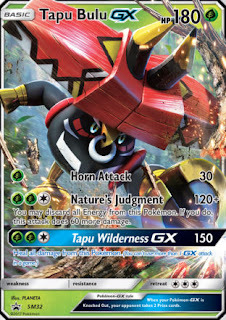 With not just one but two fire decks seeing top-five success, it's unsurprising Metagross hasn't been doing well. Ninetales, for its part, just sometimes lacks consistency and doesn't have a terrific Gardevoir-GX matchup. Greninja BREAK took a huge drop from T-4th to 12th and also failed to make Day 2 at Bremen Regionals on the same weekend. 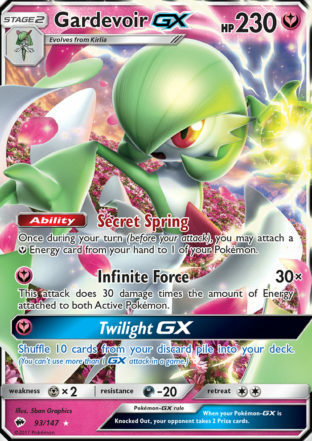 Moving further down the list we see that Decidueye-GX is still not entirely gone, with a trifecta of Top 4 Cup finishes for DeciTales. Solgaleo-GX/Rayquaza has been seeing a bit of hype with Tyler Ninomura taking it to Top 8 and Athavan Balendran making multiple Top 8s over the past two weekends with the deck. Some wild and wacky decks that managed to make top cut include Kingdra, M Mewtwo/Turtonator, Salazzle-GX/Lurantis, and Turtonator-GX/spread attackers, among others. Lastly, the following decks had at least one top cut the weekend of September 9-10 but failed to repeat the feat in our sample for 16-17: Crabominable, Garbodor/spread attackers, Gardevoir-GX with Alolan Ninetales-GX, Pikachu-EX/Magnezone, Salazzle-GX/spread attackers, and Turbo Darkrai. As always, full top cut standings and a handful of decklists for our League Cup results reporting are available under the League Cup Results tab right here on PokeStats. For detailed statistics and rankings, click the Cup Statistics tab. Analysis: I've seen Mew in VikaBulu once before (a Top 64 list from Liverpool Regionals) and found it interesting enough to tweet about. It's an excellent way to conserve an attacker and force a 7-Prize game. Bartosovic took that a step further and included two Mew, making the tiny little Psychic Pokemon effectively one of the deck's main attackers. If the opponent can't Guzma around it, it can set them back very quickly and I'm positive that's one of the main reasons Bartosovic took this list into Top 8. Max Potion is not particularly common in Bulu lists but makes a lot of sense to me since Bulu typically discards its Energy after attacking; a copy of Max Potion essentially gives you a second Tapu Wilderness GX each game. Some consistency options like Nest Ball and a second Heavy Ball appear to take the place of a consistency draw card like Oranguru; a third Field Blower was a good meta call with Garbotoxin being very prominent in Liverpool (all of the Top 4 decks played Garbodor). This list has foregone Brock's Grit in favor of a second Energy Recycler, and I expect this to be the standard for VikaBulu going forward. Too often, Brock's Grit cannot be found when needed or, more commonly, would need to be used in tandem with another Supporter (like Sycamore) to have much success. Energy Recycler allows for combinations like Recycler > Strong Charge > Sycamore > attach to power up a Bulu out of nowhere, so Brock's Grit is just inherently a slower and less consistent card. The two Recycler also explains the lack of a 5th Lightning Energy which so many other lists play. There is no Tapu Koko-GX or Professor Kukui which would seem to make the Metagross-GX and Gardevoir-GX matchups more difficult, but Mew undoubtedly helps with those. 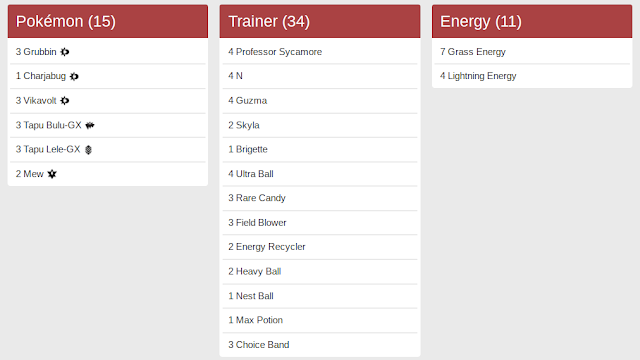 Four other VikaBulu lists are available via our League Cup Results page; take a look at those and compare them to Bartosovic's list to get a look at other ways to build Bulu, whether you want to play the deck at your next event or be prepared to play against it. There's no reason to expect Gardevoir-GX to not be the BDIF for a third straight weekend, but it wouldn't be surprising to see it fall slightly as people pick up techs like Jirachi XY67 or Enhanced Hammer. As we saw last weekend, the success of Fire-types is pushing Metagross out of the top tier of decks, so Gardevoir is essentially losing its only hard-counter. Speaking of Fire, during the making of this post I saw Kian Amini's Tweet about taking 2nd at a Cup with Ho-Oh/Salazzle. That's yet another big name (in addition to Xander Pero and the Schemanskes) choosing to play this deck, and it should be high on your list of decks to look out for heading into this next round of Cups. A couple rogues that are projected to see slight increases in play include Kingdra and Solgaleo-GX/Rayquaza. Thanks for this man, keep it up. Super useful information here.